With less than 40 days until the games begin, here’s how to hit all the Dallas hot spots during NCAA Women’s Final Four Weekend thanks to the Dallas CityPASS. Purchase your Dallas CityPASS online for easy access and discounted admission to some of our most popular attractions. By buying your CityPASS ahead of time, you’ll skip the ticket line and go right in at six of Dallas’ most exciting attractions – and that means more time for your BIG adventure. The Sixth Floor Museum at Dealey Plaza chronicles the life, assassination and legacy of President John F. Kennedy. Experience a memorable time in history with thoughtful exhibits and artifacts – a must-see for any Dallas visit and just a quick 15-minute walk from the American Airlines Center. The exhibit, set up as a timeline leading up to the November 1963 events, includes one-of-a-kind historical photographs, films, artifacts and documents that tell the story of JFK’s assassination as well as that of his family life and presidency. Escape for a moment from the games to get outside! Explore 66 acres of 11 lush gardens on display at the Dallas Arboretum and Botanical Garden. This season, you’ll see beautiful spring florals during Dallas Blooms, the largest outdoor floral festival in the Southwest. You’ll fall in love with this year’s Flower Power theme. Visit the world-class, 106-acre Dallas Zoo – it’s the largest in Texas and features many rare and endangered species. The Giants of the Savanna, an 11-acre safari experience is where you can get up close and personal with giraffes, elephants, lions, cheetahs and many other African species. If you came to Dallas for the games with the whole family, this is a good one that will entertain even the hardest to impress. The Library and Museum, on the beautiful SMU campus, features both permanent and special exhibits, a precise replica of the Oval Office, beams from the World Trade Center twisted from the events of 9/11, a Texas Rose Garden, and several interactive exhibits. The popular Decision Points Theater lets you experience the presidential decision-making process firsthand. The Library and Museum is an only-in-Dallas experience, so you have to take advantage during your Dallas getaway. Your trip to Dallas is not complete without a visit to the world-known Reunion Tower! 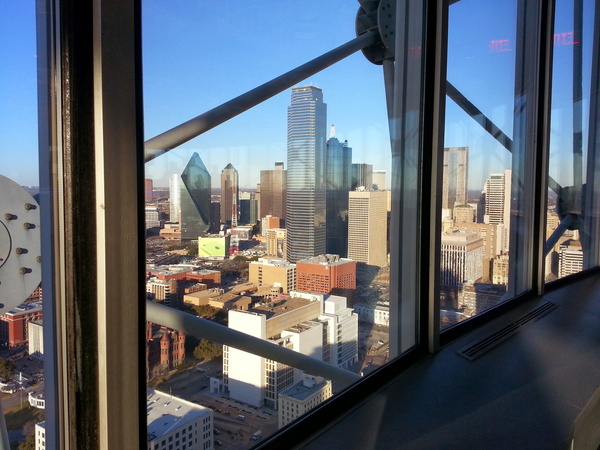 Perched 470 feet above ground, Reunion Tower’s GeO-Deck lets you see an impressive view of the Dallas skyline. Not only will you see stunning topography with the naked eye, but also with powerful telescopes, high-definition zoom cameras and interactive digital displays. One of the closest attractions to the American Airlines Center, the Perot Museum is perfect for an afternoon of science and thrills. Five floors house 11 permanent exhibit halls including an earthquake stimulator, an impressive collection of beautiful stones and gems, and a Sports Hall that will have you racing the clock against (digital) Olympic athletes and a cheetah. NCAA is a trademark of the National Collegiate Athletic Association. All other trademarks are property of their respective holders.